I’ve heard countless stories of people traveling (often through developed countries) on very small amounts. I’ve even heard of a family traveling the globe on only $25k per year. And while it sounds great in theory, once you hit the road, you realize it’s not so easy. Like most goals, the key to sticking to a travel budget is finding a method that’s unobtrusive, so you actually stick to it. Doing so will ensure more travel, more fun, less worry, less work, and returning home later (if ever). 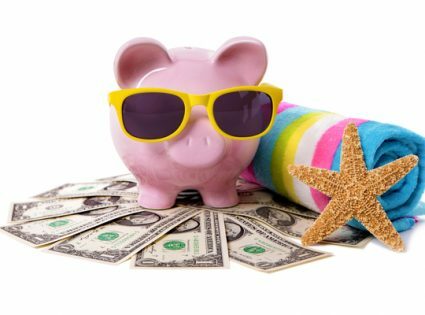 So yes, it is possible to create a travel budget that you’ll stick to. Seasoned travelers tend to allocate an appropriate daily travel budget to each location. If they want to stay longer, simple: they find work, sell some wares, or do anything to increase the total cash available. Inexperienced budgeters come unstuck by underestimating the average cost of living. This occurs when they fix the length of stay and adjust their daily travel budget accordingly (rather than the other way around). While it’s possible to ration food and expenses to adhere to a time-frame, it doesn’t last long as the fun level dips to zero. So the main tip here is, to be honest with yourself about what you need on a day-to-day basis and make sure you account for everything. It’s easy to forget airport taxes, visa fees, in-country taxes, tips, etc. Deciding what you have available to spend each day is the easy part. The difficult part is sticking to it. And the only way to stick to a travel budget is to monitor expenses (or go into hibernation and don’t spend a cent). The following table shows a simple travel budget journal. You fill in the Dates, Countries and Budget columns beforehand. Then when you’re on the road, you fill in Income, Expenses and calculate the Actual balance. The goal is simple, to keep your Actual balance above your Budget. As expected, the Actual column fluctuates around the Budget column. You don’t want to become so obsessed as to develop a routine, but you should know how close you are to what you originally budgeted. The further you are, the shorter your time away. If your budget is $15 for the day, but it’s going to cost $100 to paraglide plus $40 for lunch and drinks afterward (as per 07-Jan-11 in the example), by all means, don’t let the travel budget stop you. Just know that you’ll have to employ some discipline afterward to make good. That may mean cooking at home for a week or finding work to supplement your activities. So, we know how to budget and we know how to monitor our expenses in theory, but how does this work on location? Well, all you need is a notebook or spreadsheet. Don’t go to the trouble of recording every expense, just tally up the day’s income and expenditure accurately. You can check the numbers with your bank balance to find mistakes. More than anything, this process will teach you about your spending habits and instill some discipline. The reason we don’t record every expense is it’s too time-consuming and it doesn’t really matter. If you’re spending too much, you’ll soon realize and be able to determine what you need to do to extend your stay. The skill of budgeting has nothing to do with drawing tables and recording expenses. It has to do with managing unforeseen events. Your plans are bound to change because if you’re like me, you don’t plan more than a week or so ahead. What if I Don’t Have the Discipline? Most of us don’t (including me). The solution is to force spending limits. Keep your money in one account that you cannot access immediately. It may be an online savings account without a key card and without physical branches. Then, open another account with a card, but without a relationship with the first bank, so it takes a few days for the money to transfer. Now all you do is transfer enough money ahead of time. Let’s say your daily travel budget is $15, you can transfer $75 every 5 days of expenses. If you have the urge to buy a Swiss watch, an expensive round of drinks, or a rare souvenir, you won’t be able to because you’ll only have $75 at most (and likely a lot less). This may sound a little excessive, but you’ll quickly learn to plan ahead and think logically about expenditure. In cases of emergency, you’ll learn to be creative. I’ve lived like this for years, and when I really need money, I always work something out.